With the Apple iPad arriving in less than two weeks, Sony is making things interesting in the e-reader market by temporarily cutting the price of its Pocket Edition device by $30. The low-end Sony Reader drops to $170 through April 3, which not coincidentally is the same weekend the iPad starts to ship. Prices on Sony's more advanced e-readers, including the $300 Touch Edition and the $400 Daily Edition remain the same. The Pocket Edition's price cut, albeit temporary, may boost its appeal to cost-conscious e-book fans who find more popular e-readers, specifically the $259 Amazon Kindle, too pricey for their tastes. 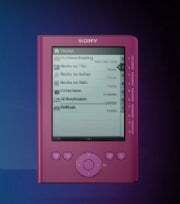 The Sony device has one significant shortcoming, however. Despite its intuitive controls and sleek design, it lacks the Kindle's wireless capabilities. To download an e-book from the Sony Reader Store, for instance, you must first connect the Pocket Edition to a Mac or Windows PC via USB cable, a throwback concept in an increasingly cordless world. Of Sony's three e-readers, only the top-of-the-line Daily Edition is wireless. Analysts assert that hardware prices must fall if e-readers are to gain mass-market acceptance. A Forrester Research study last year predicted that e-readers could eventually cost as little as $50, a loss-leader strategy that might work if the industry adopts a subscription model similar to one used by wireless carriers and mobile phone manufacturers. In the Forrester scenario, however, newspaper and magazine publishers, still searching for a profitable 21st-century business model, would subsidize the e-reader hardware in exchange for a long-term user subscription. The Sony Reader price cut may also signal the start of segmentation in the e-reader market. At the high end, tablets such as the iPad and HP Slate will likely appeal to consumers who want a multifunction device, while the traditional (and relatively cheap) e-readers could appeal to e-bookworms who want a single-use device.